1. Wisk together olive oil, garlic, thyme, oregano, black pepper in small bowl. 2. Pour olive oil mixture into large zip-lock bag, add scallops, seal bag and refrigerate for 30 minutes. 3. Lightly coat a medium sauté pan with olive oil. Heat pan to medium heat. 4. 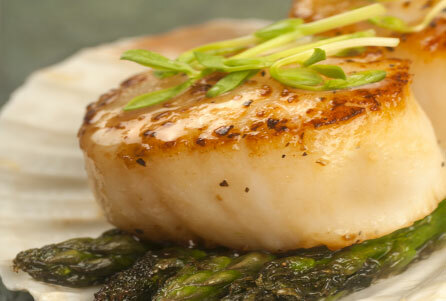 Remove scallops from olive oil mixture then place in pan and sprinkle with Smoked Kiawe Sea Salt. 5. Cook until golden brown on each side; about 2 minutes each side. 6. Serve over steamed asparagus.